"Within the hostile environment of the Probability Aperture, a high-tech research complex called Horizon vanished from the grid," explains the MEG 9: Lost Echoes announcement. "In the darkness, surrounded by nightmarish creatures, the lone AI-construct MEG has triggered a distress call." 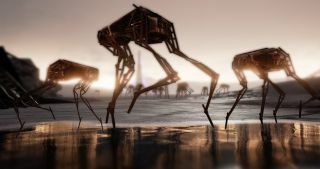 It's a thin setup, but intriguing, and all the more so because developer Skunkwerks Kinetic is creating the game in conjunction with William Gibson, author of the seminal cyberpunk novel Neuromancer. And it certainly sounds like it: The Probability Aperture is "a dimensional disjunction generated by the multinational corporation Quantum Multiphasics," which also happens to be your employer. Many different phenomena exist within the Horizon, the most dangerous of them called the Corruption, an intelligent entity that takes over equipment and power sources, turning them into lethal biomechanical monstrosities. In this hostile environment, players will take control of the Rig, a massive, remotely-operated vehicle kitted out with cutting-edge military hardware, and use it to explore the "large facilities, beautiful oases, labyrinthine tunnels, and vast deserts" that make up the Horizon. The Rig can be upgraded and customized, while MEG will assist with collecting parts and artifacts, and hacking into Horizon's terminals. (Hey, it's William Gibson, remember.) Your goal is simple: Discover the truth. A Skunkwerks Kinetic rep said Gibson is in "constant communication" with the team, helping with narrative direction and ideas. "William Gibson developed the backstory and many of the concepts showcased within MEG 9: Lost Echoes," the studio said. "We have been working with him since the very beginning of the MEG project to give our audience a unique sci-fi universe." MEG 9: Lost Echoes is still in the early stages of development, but a playable demo will be available at PAX Prime later this month, so we should be hearing quite a bit more about it in the next few weeks. It's also up for your approval on Steam Greenlight.